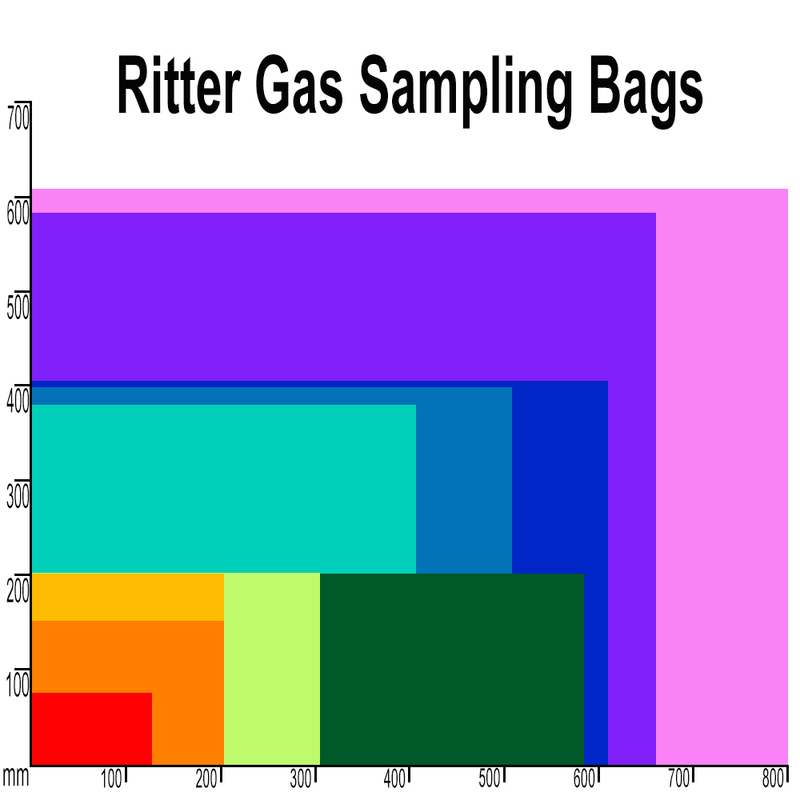 RITTER air/gas sampling bags have been specifically designed for easy and reliable collection of air & gas samples. The non-permeable, opaque and chemically inert properties of the bags ensure that the collected gases remain uncontaminated and unaltered. The sampling bags provide a simple and economical method of collecting and transferring air & gas samples from any collection point to a centrally located test instrument or laboratory for analysis, ideal for use in hard-to-reach locations. The bags can also be used to collect vapours, or may be used with odour test panels. . The construction and materials of the RITTER Gas Sampling Bags ensure the physical integrity of any sample taken, and allow it to be stored without change over time. Correct use of the gas sampling bags result in a collected sample that is representative of the environment or process medium from which it was collected (taken), either as a grab sample or a Time Weighted Average. Portable gas sampling bags allow absolute freedom of movement and measurement over a wide area of sample points. Determining if and where a gas or pollution problem exists becomes an easy and inexpensive task. Contains six different layers of materials: Polyethylene terephthalate (outside), Polyethylene, Aluminium Foil, Polyamide, Polyethylene, Polyethylene (inside). The layers are bonded together to form a single flexible material of 131 micrometer thickness. The Twist-Type Double-O-Ring Valve operates in the same way as the Twist-Type Valve. However, this valve has the special added feature of a secondary O-ring installed on the valve stem, greatly reducing or eliminating gas loss at recommended inflation pressures. The Luer-Fit Valve™ is a secure, self-closing valve which cannot be opened or left open accidentally, thus preventing any loss of gas or liquid sample. It is easy to use and requires no turning or twisting of the valve stem. The Luer-taper Quik-Mate™ Connector (standard with each Luer-Fit Valve™) is a flow-through adapter for instant (push-pull) connection of tubing to the valve. The tapered fitting between the valve stem housing and Quik-Mate™ Connector becomes tighter as pressure is exerted on the Quik-Mate. This ensures a gas-tight fit between the sample line tubing and the Luer-Fit Valve™. Gases can be inserted or withdrawn through the use of either sample line tubing or a syringe with a Luer-taper barrel fitting. This valve can eliminate the need to work with syringe-needles, if desired. Please Note: Because of its tiny gas channels, the Luer-Fit Valve™ is not suitable for gases containing particles. It also has a lower flow rate than other valve connections at the same pressure. “Dead space” may occur when using a syringe with a needleless syringe barrel, to withdraw or inject sample gas or liquid through the valve-stem housing. When a septum is affixed to a bag with an adhesive, every penetration of it by a syringe makes another hole in the bag. This leads to continued bag deterioration and reduces its useful life. An optional replaceable septum holder allows the user to change the septum as required. Replaceable septum holders are available in the following materials: Delrin, Nickel plated brass, and Polysulfone. Stainless steel is available on special order.